Staining of human peripheral blood granulocytes with Mouse anti Human CD32 (MCA1075). Staining of human peripheral blood granulocytes with Mouse anti Human CD32:Alexa Fluor® 647 (MCA1075A647). Staining of human peripheral blood granulocytes with Mouse anti Human CD32:FITC (MCA1075F). Staining of human peripheral blood granulocytes with Mouse anti Human CD32:RPE (MCA1075PE). The Fc region of 24F4A enhances the inhibition of immune complex‐induced IFNα production by human pDCs A–F Isolated human pDCs were treated with increasing concentrations of 24F4A (red circles), 24F4A‐ef (black squares), or 10 μg/ml of the isotype control (black triangle) and stimulated with 5 μM of R848 (A and B), 1 μM of CpG‐A (C and D), or immune complexes (E and F) for 16 h at 37°C. IFNα concentrations in cultured supernatants were determined using ELISA. Representative plots for each stimulation (A, C and E) and the average IC50 of 24F4A and 24F4A‐ef for each stimulation condition (B, D and F) are shown (n = 3). Horizontal bars represent mean IC50, and error bars represent SD of the mean from three independent experiments. G. Isolated human pDCs were treated with 10 μg/ml of 24F4A (black line), 24F4A‐ef (gray shaded histogram), or the isotype control (gray dotted line) for 10 min at 37°C. Flow cytometry was used to evaluate pSYK and pPLCγ2. Shown is a representative plot of two independent experiments. H. Isolated pDCs treated with 10 μg/ml of anti‐CD32a (AT10) and stimulated with CpG‐A, R848, or immune complexes. Error bars represent SD of percent inhibition of IFNα from three independent experiments. From: Pellerin A, Otero K, Czerkowicz JM, Kerns HM, Shapiro RI, Ranger AM, Otipoby KL, Taylor FR, Cameron TO, Viney JL, Rabah D.
Anti-BDCA2 monoclonal antibody inhibits plasmacytoid dendritic cell activation through Fc-dependent and Fc-independent mechanisms. EMBO Mol Med. 2015 Mar 11. pii: e201404719. 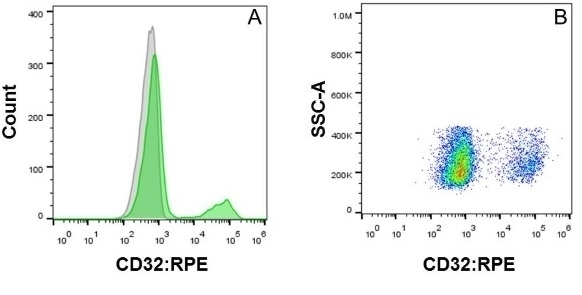 Detection of CD32 in normal human peripheral blood cells using the Bio-Rad S3 Cell Sorter. 1x106 cells were suspended in 100μL buffer and stained with 10μL Mouse anti Human CD32:RPE (MCA1075PE). Lymphocytes were gated for analysis (A): Histogram overlay with stained cells represented in green and unstained control cells in grey. (B): Density plot of CD32 cells. Mouse anti Human CD32 antibody, clone AT10 (MCA1075) used as a blocking agent to assess the effect of FcγRs on heparin binding protein (HBP) release by ELISA. Antibodies against FcγRII inhibit HBP release. Whole blood (diluted 1∶10) was incubated with antibodies against different FcγRs, isotype control antibodies, or buffer alone, for 20 minutes at 37°C. M1 protein was added and the HBP release was measured. Data are expressed as percentage of release without any antibodies added, and are the mean±SD from three different individuals, each done in duplicate. The different treatment groups were compared using ANOVA, and when found significantly different the treatment groups were compared against the control group using Dunnett's 2 sided test. From: Kahn F, Mörgelin M, Shannon O, Norrby-Teglund A, Herwald H, Olin AI, et al. 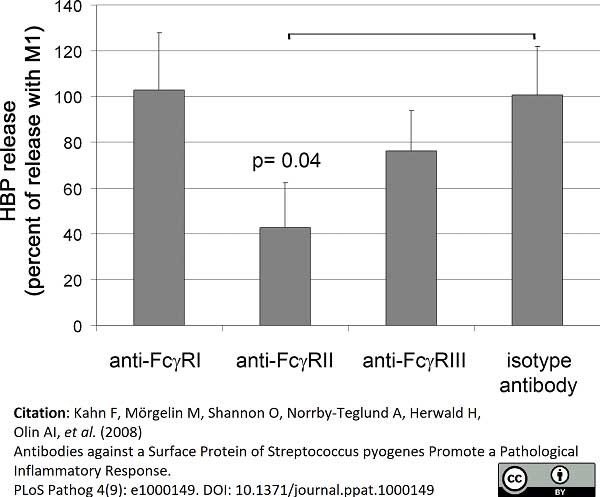 (2008) Antibodies against a Surface Protein of Streptococcus pyogenes Promote a Pathological Inflammatory Response. PLoS Pathog 4(9): e1000149. 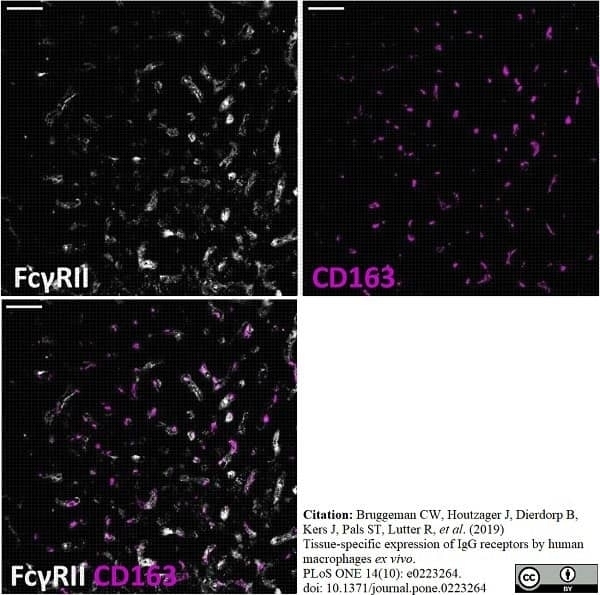 Mouse anti Human CD32 antibody, clone AT10 recognizes the human CD32 antigen, a ~40 kDa glycoprotein that acts as a low affinity receptor for IgG (also known as Fc gamma RII). CD32 mediates several functions including endocytosis, activation of secretion, cytotoxicity and immunomodulation. CD32 is expressed by B cells, monocytes, granulocytes and platelets. Mouse anti Human CD32 antibody, clone AT10 blocks the binding of IgG to Fc gamma RII (Larsson et al. 1997). Greenman, J. et al. (1991) Characterization of a new monoclonal anti-Fc gamma RII antibody, AT10, and its incorporation into a bispecific F(ab')2 derivative for recruitment of cytotoxic effectors. Mol Immunol. 28 (11): 1243-54. Van Den Herik-Oudijk, I.E. et al. (1994) Functional analysis of human Fc gamma RII (CD32) isoforms expressed in B lymphocytes. J Immunol. 152 (2): 574-85. Lilliehöök, I. et al. (1998) Expression of adhesion and Fcgamma-receptors on canine blood eosinophils and neutrophils studied by anti-human monoclonal antibodies. Vet Immunol Immunopathol. 61 (2-4): 181-93. Larsson M et al. (1997) Human dendritic cells handling of binding, uptake and degradation of free and IgG-immune complexed dinitrophenylated human serum albumin in vitro. Dutertre, C.A. et al. (2008) A novel subset of NK cells expressing high levels of inhibitory FcgammaRIIB modulating antibody-dependent function. J Leukoc Biol. 84 (6): 1511-20. Devriendt, B. et al. (2010) Targeting of Escherichia coli F4 fimbriae to Fcgamma receptors enhances the maturation of porcine dendritic cells. Vet Immunol Immunopathol. 135: 188-98. Sims, G.P. et al. (2005) Identification and characterization of circulating human transitional B cells. Benitez-Ribas, D. et al. (2006) Plasmacytoid dendritic cells of melanoma patients present exogenous proteins to CD4+ T cells after Fc gamma RII-mediated uptake. J Exp Med. 203: 1629-35. Zhao, X.W. et al. (2011) CD47-signal regulatory protein-α (SIRPα) interactions form a barrier for antibody-mediated tumor cell destruction. Proc Natl Acad Sci U S A. 108 (45): 18342-7. Araújo, M.S.et al. (2011) Immunological changes in canine peripheral blood leukocytes triggered by immunization with first or second generation vaccines against canine visceral leishmaniasis. Vet Immunol Immunopathol. 141: 64-75. Santer, D.M. et al. (2010) C1q deficiency leads to the defective suppression of IFN-alpha in response to nucleoprotein containing immune complexes. Shannon, O. et al. (2010) Platelet activation and biofilm formation by Aerococcus urinae, an endocarditis-causing pathogen. Ito, T. et al. (1999) A CD1a+/CD11c+ subset of human blood dendritic cells is a direct precursor of Langerhans cells. Moreira, M.L. et al. (2016) Vaccination against canine leishmaniosis increases the phagocytic activity, nitric oxide production and expression of cell activation/migration molecules in neutrophils and monocytes. Gazendam, R.P. et al. (2016) Impaired killing of Candida albicans by granulocytes mobilized for transfusion purposes: a role for granule components. Liu M et al. (2011) Vitellogenin mediates phagocytosis through interaction with FcγR. Mol Immunol. 49 (1-2): 211-8. Petersson, F. et al. (2018) Platelet activation and aggregation by the opportunistic pathogen Cutibacterium (Propionibacterium) acnes. PLoS One. 13 (1): e0192051. Kahn, F. et al. (2008) Antibodies against a surface protein of Streptococcus pyogenes promote a pathological inflammatory response. PLoS Pathog. 4 (9): e1000149.